The technology adoption life cycle is a sociological model that describes the adoption or acceptances of new products and innovations at businesses. To market and sell innovative products and technology, organizations must understand the personality traits in which people accept innovation which are defined by psychological characteristics. VALiNTRY will create technology to help your organization reduce costs and increase business. Diffusion research examines how products and services are spread among groups of people. Most people adopt these products and services in a time sequence and are classified into adopter categories. Adopter categories depend on how long it takes for them to begin using these solutions. Consumer adoption patterns are important in understanding to market new products and services to organizations. When a company understands the path taken for technology adoption, they can seek to target marketing to each specific audience and help with adoption and increase and business. The technology adoption life cycle is a sociological model that describes the adoption or acceptance of a new product or innovation, according to the demographic and psychological characteristics of defined adopter groups. Innovators: The Innovators represent 2.5% of the market. Innovators are the first individuals to adopt an innovation. Innovators are willing to take risks, are usually younger in age, have financial lucidity and have closest contact to scientific sources and interaction with other innovators. Their risk tolerance allows them to adopt technologies which may ultimately fail but their financial resources help absorb these failures. Many in this category are considered to be leaders and are well respected, their peers will be more likely to pick up the new behavior. Early Adopters: The Early adopters make up 13.5% of the market. This is the second fastest category of individuals who adopt an innovation. These individuals have the highest degree of opinion leadership the other adopter categories. Early Adopters are usually younger in age, like innovators, have more financial lucidity and are more socially forward than late adopters. Early adopters are more discrete in adoption choices than innovators. Early Majority: The Early majority represent 34% of the market. Individuals in this category adopt an innovation after a varying degree of time. This time of adoption is significantly longer than the innovators and early adopters. 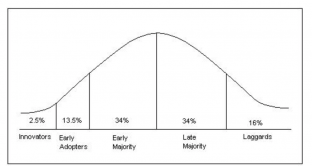 Early Majority tend to be slower in the adoption process but have contact with early adopters and seldom hold positions of opinion leadership in a system. Late Majority: The Late Majority represents 34% of the market. Individuals in this category wait until an innovation has been accepted by a majority of consumers and the price has dropped to adopt the new product. When Late Majority adopt the new product, the product has become well accepted by a solid majority of the target audience. The late majority typically adopt innovative products because they are skeptics and feel as if everyone else is doing it. Laggards: The Laggards make up 16% of the market. Individuals in this category are the last to adopt an innovation. Laggards show little to no opinion leadership. These individuals typically have an aversion to change agents and tend to be advanced in age. Laggards typically tend to be focused on traditions and have the lowest financial fluidity. They are the oldest of all other adopters and have very little to no opinion leadership. Technology diffusion can be defined as the process by which innovations are adopted by a population. Whether diffusion occurs and the rate at which it occurs is dependent on several factors which include the nature and quality of the innovation, how information about the innovation is communicated and the characteristics of the population into which it is introduced and costs. Some products are quick to pass through the adoption lifecycle and some take decades, but they all are adopted through the same process. Think about the stage in which the consumer is in and how the marketing team representing the technology are communicating to that audience. Sustaining Innovations: These are aimed at the most profitable customers or organizations who are willing to pay for technologies that will improve or maintain profit margins by increasing existing business processes and cost structures in order to make the best use of current competitive advantages. Businesses that use technologies that are used by customers for products and services. New Market Disruptions: This targets customers and organizations who have needs that were previously unserved by technologies. This type of disruption targets non-consumption. These are customers who have not had access to the features and functions due to lack of money or skill. The business model must work with low production and sales volumes products and services. Low-end Disruptions: This occurs when the rate at which products improve exceeds the rate at which customers can adopt the new performance. Low-end disruption occurs when innovators offer a product or service that helps the least-demanding customers at a lower price. Like all Disruptive Innovations, they also possess a technology that enables companies to improve their products’ faster than consumers’ can use the improvements. Disruptive technologies hold within the capacity to change processes and increase business for businesses. There are Six Points of Innovation that help organizations find which technologies to adopt as innovators. Increasing efficiency and lowering costs this can occur with peer-to-peer businesses. Saving money when possible by using car-share companies. These six points help organizations identify potential opportunities for innovations for their company. VALiNTRY will evaluate your organization’s needs and create the right technology to help reduce costs and become an innovator with solutions.